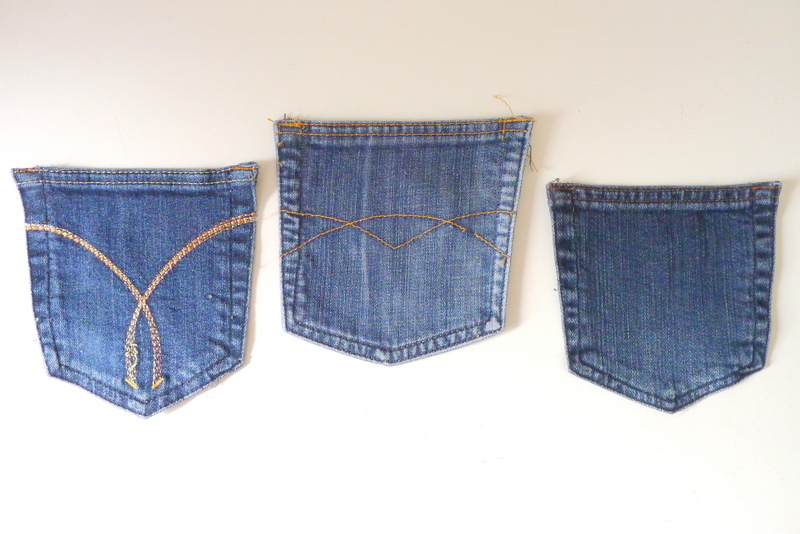 What do you make with old denim trousers? I don’t know about you but I always seem to have some poor fitting jeans around ready for recycling. 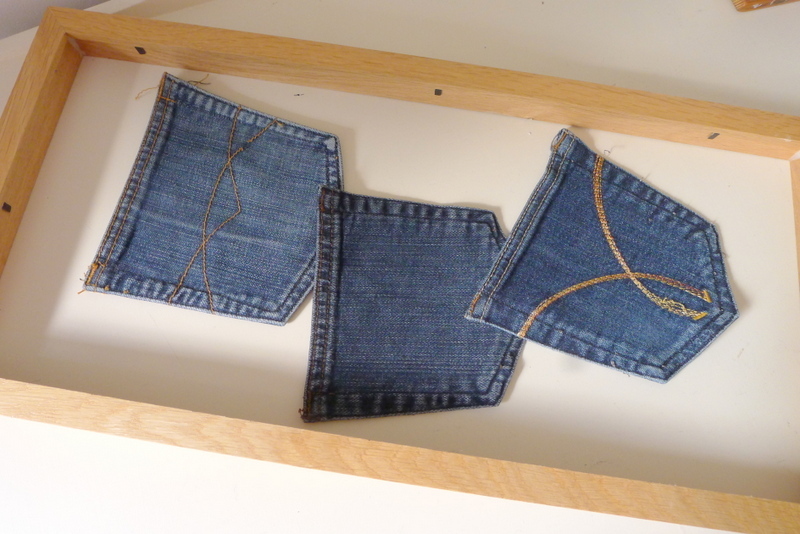 There are lots of great tutorial around, I’ve started making some denim baskets for my sewing room for storing odds and sods in! If you fancy making your own they are ever so easy, there’s a great tutorial on Threading My Way. The storage baskets use up the legs of denim trousers, and my sewing machine, gorgeous though it is won’t cope with reusing and stitching through a waistband. However I can still squeeze another project out of the jeans, plus make a further effort to sort my sewing room out (one day I will share my space but I keep waiting for a tidy moment, you may be waiting a while!). 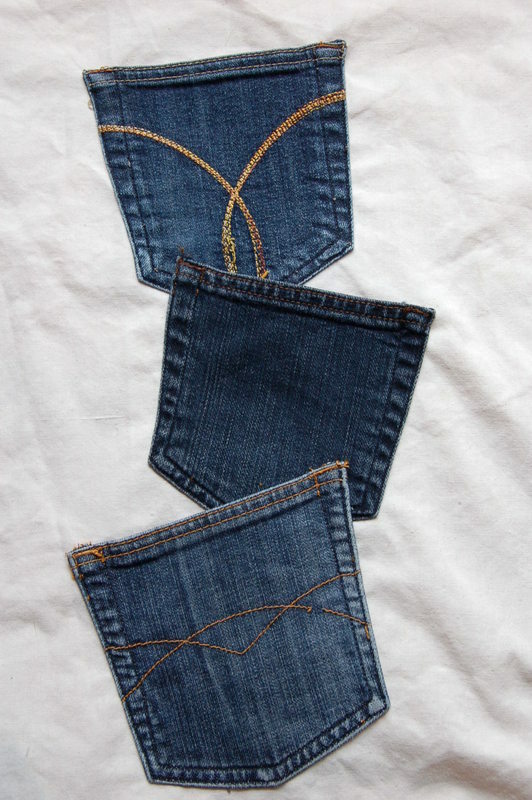 Here is a denim pocket storage idea, a Pinaddict challenge. 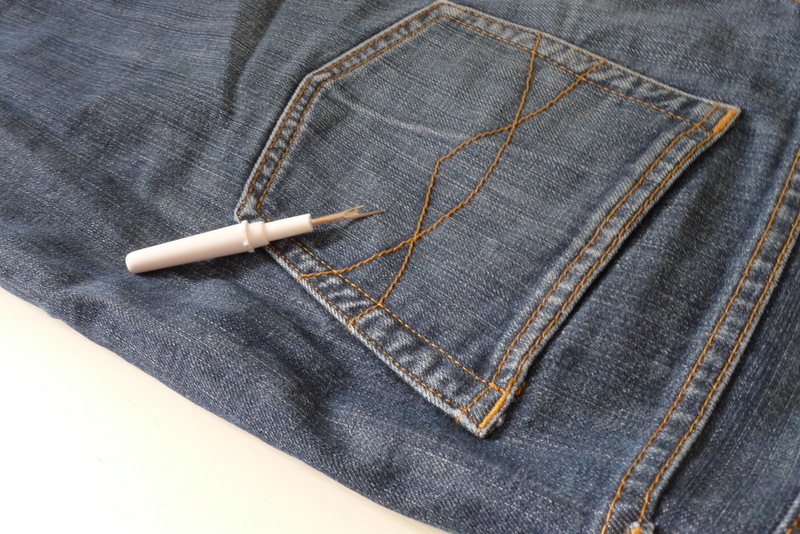 Arrange your pockets, and stitch on. Stretch around the frame. I was delighted that I remembered a few pointers from screen printing days. Start with stretching across the middle, stapling at the middle central points along each edge. Step by step stretching and stapling along, always at each side in turn. At the corners I created a hospital bed corner, folding under. 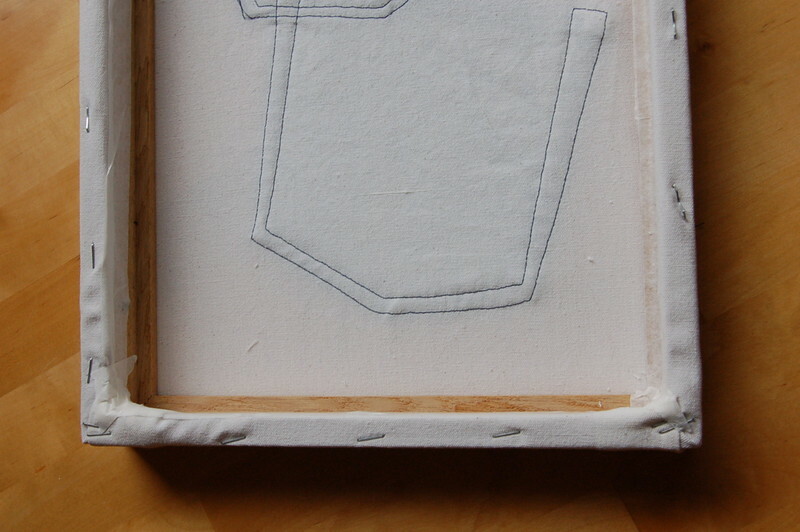 Finish by masking taping the fabric edges down to the frame for a tidier finish. 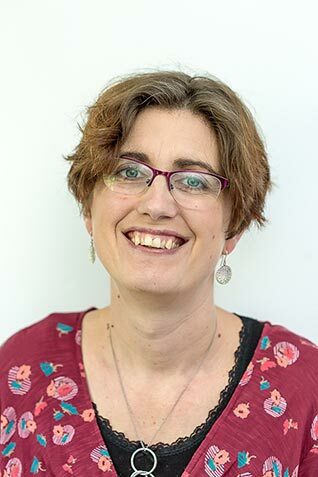 Vicky, I love what you create – really wonderful! The pockets on canvas is quite inspired! I love the little basket too. I’m a big fan of upcycling and jeans are perfect for reusing. Such excellent ideas. The pockets are really fun. I love the fabric that you have used for the basket lining. If we were all like you charity shops would go out of business! What great ideas. I love any project that makes good use of something you might otherwise throw away. Love the pockets! What a great storage idea! 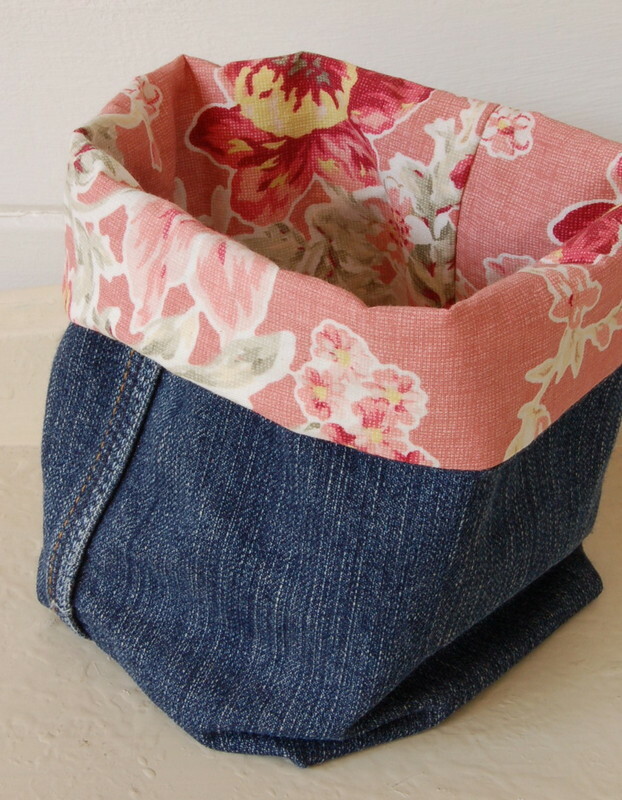 I love using denim for baskets, it’s a great way to reuse old jeans, love the pocket idea. That is a nifty way to store your scissors and other bits and pieces. I use my denim baskets in my sewing room, too, Vicky. Beautiful fabric you’ve used for the lining in yours… looks great!!! I’d love you to add a photo to the Threading My Way ~ Sewn by YOU Flickr Group Thanks so much for the link back. Love your denim idea. I’ve been making denim bags, with old curtain fabric and vintage doilies. The baskets are really cute and look like they are within the range of my sewing skills! They’d be great to hold bits and bobs in the bathroom too. The pockets for storage are fab. 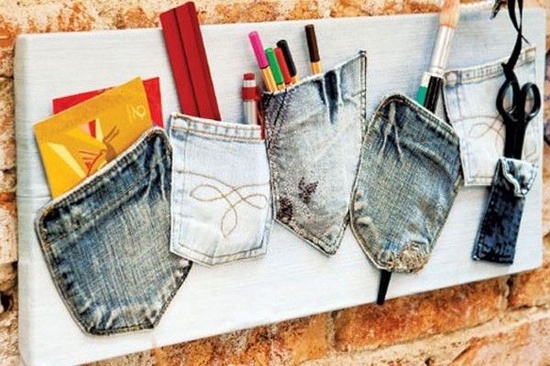 Great ways to use up denim….I have several pairs of ill-fitting jeans, think I might give those storage baskets a go. Thanks for sharing. Love this idea! Such a cute way to recycle! I have loads of old jeans I’ve kept for future projects these ideas are great! 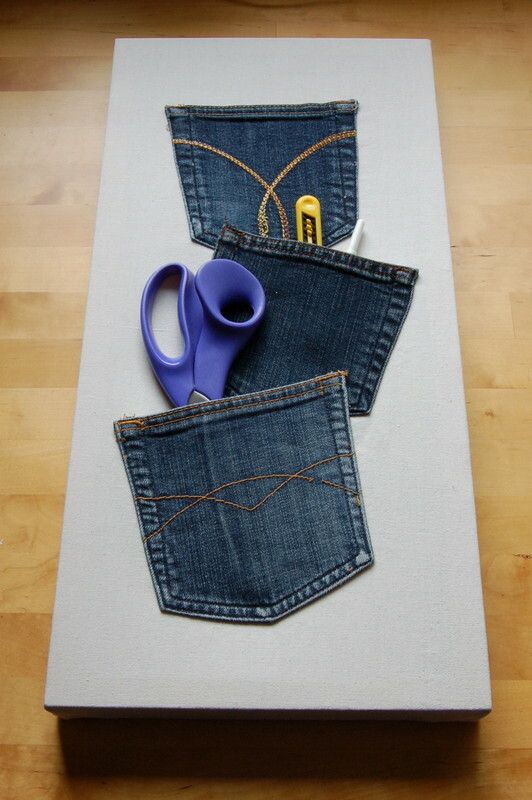 I’m going to be jumping for joy the next time a pair of jeans dies on me – I know what I’ll be making!